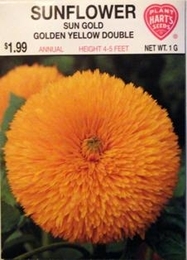 Stately plants bearing large, double, Chrysanthemum-like golden yellow flowers. Excellent for backgrounds and screening, also as cut flowers. Thinning - when plants are 2-3 inches tall thin to 24 inches apart.